Life’s a breeze thanks to the amenities we offer at The Daley in Rockville, MD. 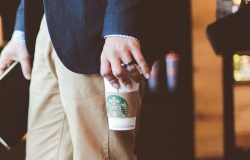 Whether it’s a day of fun, a day of rest or a day of work, start it off right with a hot cup of coffee from our on-site Starbucks. 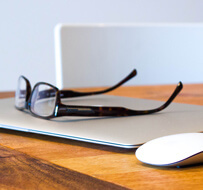 Need to work from home? Head to the E-booth where you can hunker down, connect to the Internet and get stuff done. 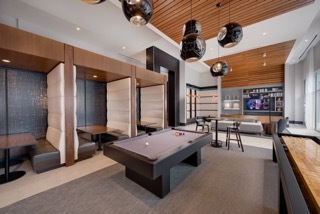 Blow off some steam after a long day of work in our game room with some pool or hit the gym. 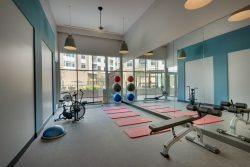 Choose from several fitness options at The Daley including indoor and outdoor yoga and fitness centers. Invite all of your closest friends for a formal dinner at The Daley’s private dining room. Or, kick back and spend a lazy Saturday sunning at the outdoor pool, cooking on the outdoor grills and relaxing in the courtyard. Feel at home in The Daley’s living room where you can hang out with friends, catch up on some TV or get lost in your favorite novel. 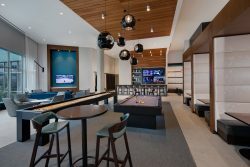 Make it a game night with some billiards and drinks with friends in The Daley clubroom. 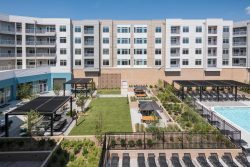 Other amenities not to overlook: On-site bike storage and tune-up center, pet spa, Amazon package service, and controlled access parking garage. Which of The Daley’s amenities are you most excited to use? Contact us today for more information on life at The Daley or to schedule a visit.